Our Alloa Florists work with the best quality flowers which have been cultivated and then directly imported to us all the way from our suppliers in Holland. Combined with up to four deliveries per week, not only are our flowers of the highest calibre but they are also the freshest with a high longevity so your recipient will be able to enjoy their flowers for many days to come. Our Alloa Florists hold our customers as our number one priority which is why they always go above and beyond when it comes to your orders. One such way they do this is by offering our customers the bespoke service. The bespoke service allows our customers to work with our Alloa Florists to create the perfect bouquet for your recipient. You can tell our Alloa Florists what flowers to use, what flowers not to use, colour preferences, how you want your flower arrangement to be finished off and our Alloa Florists would be more than happy to create a bouquet that is an accurate representation of your design. Our Alloa Florists work with a large array of flowers all differing in shape, size and colour so all of our bouquets are diverse and individual. Once the actual bouquet has been arranged, our Alloa Florists finish off all of our arrangements with either ribbons, papers or tissues or by placing them in a gorgeous vase, box or even a teacup depending on what sort of finish you want. 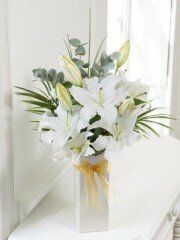 Our Alloa Florists are incredibly passionate and dedicated about their work. With over forty years of experience in the floristry business, our Alloa Florists are professionals who have and will continue to provide you with the best possible bouquets for you to give to your recipient. If you require a gift to accompany your stunning bouquet then look no further as our Alloa Florists are also able to arrange for a gift to be delivered with your flowers as we have a handy gifts range here. Our selection of gifts includes delicious chocolates; adorable teddy bears; fruit baskets in varying sizes; a selection of wines and champagnes as well as balloons which, if requested by a customer, can be arranged into a charming balloon bouquet by our Alloa Florists. We hope these gifts we have on offer can make your recipient feel that extra bit special and thought of. 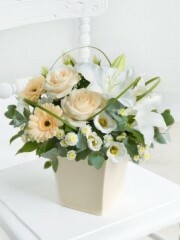 Once your order has been organised by our Alloa Florists, we have a couple of delivery services on offer to our customers. We have our standard delivery which runs weekly every Monday to Saturday, our next day delivery service as well as our same day delivery service. The same day delivery service allows you to place an order and have it delivered on the same day which means that our Alloa Florists arrange your bouquet on the day. However, in order to use this delivery service, your order must be placed before 3PM to give our Alloa Florists enough time to organise everything for you. Once your order has been placed, our Alloa Florists want our customers to know that we will take care of everything on your behalf so you are able to focus on your loved ones and your special occasion without any added stress.